System which opens or closes a window manually or automatically. It is fi tted with a system which provides protection if an obstacle is detected on the one-touch models and a deactivation system to prevent misuse of the rear switches on all models. 1. Driver's electric window switch. 2. Passenger's electric window switch. 3. Rear right electric window switch. 4. Rear left electric window switch. 5. Deactivating the rear electric window and door switches. Press or pull the switch. The window stops as soon as the switch is released. The electric window switches remain operational for approximately 45 seconds after the ignition is switched off or until a front door is opened. Press or pull the switch gently. The window stops as soon as the switch is released. Press or pull the switch fully. The window opens or closes completely when the switch is released. Pressing the switch again stops the movement of the window. The one-touch front electric windows are fi tted with a safety anti-pinch function. When the window rises and meets an obstacle, it stops and partially lowers again. continue to hold the switch for approximately one second after the window has closed. 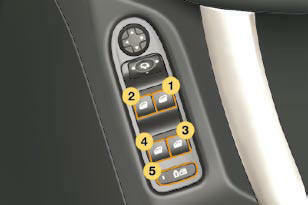 For the safety of your children, press switch 5 to prevent operation of the rear windows irrespective of their position. With the lamp on, the rear controls are disarmed. With the lamp off, the rear controls are activated. 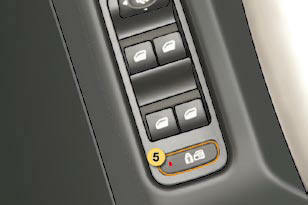 This control also deactivates the interior rear door controls (see "Child safety - § Electronic child safety").